From barrels at either side of the stage, draught Dorada is being dispensed in small plastic glasses and disorderly queues are forming. In the mêlée, there are several minor casualties; two wigs, a bedside cabinet whose contents are spilling from its drawers, a fortune-teller’s headscarf and a false nail. When everyone’s got a least one drink in their hands there’s a short interlude of repairing hair and gathering spilt accessories before resuming the promenade of the arena, posing for the hundreds of camera flashes that fill the plaza like fireflies. When the beer runs out there’s a human chain of drinks being passed from the vendors in the square, above the heads of onlookers, to the waiting manicured hands of drag queens. Small measures of coke are being liberally topped up with lashings of Arehucas rum and guzzled in the flutter of an eyelash. 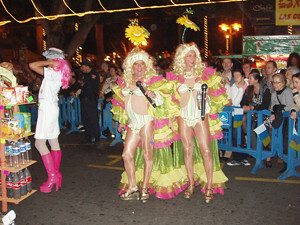 It’s the 14th Annual High Heel Drag Marathon in Tenerife’s Puerto de la Cruz and it’s the most popular event in the Carnaval calendar. This year, there are over 200 contestants and more than 35,000 spectators. The area in front of the stage is teeming with contestants, many of them topping seven foot tall in their shoes. The minimum height of heels for entry in the race is 8 cm but most contestants prefer a staggering 15 centimetre stack; calf muscles are pulled tight and backs must be near to breaking but alcohol helps to dull the pain and more than anything else, the show must go on. For 2 hours, the event’s compère and real star of the show, ‘Lupita’, calls contestants onto the stage to introduce them, indulge in a great deal of witty, double-entendre banter and tell us all how high the heels are; in this race, size matters. Costumes are extraordinary, witty, fabulous, sometimes bawdy, often weighty but always worn with panache and attitude. 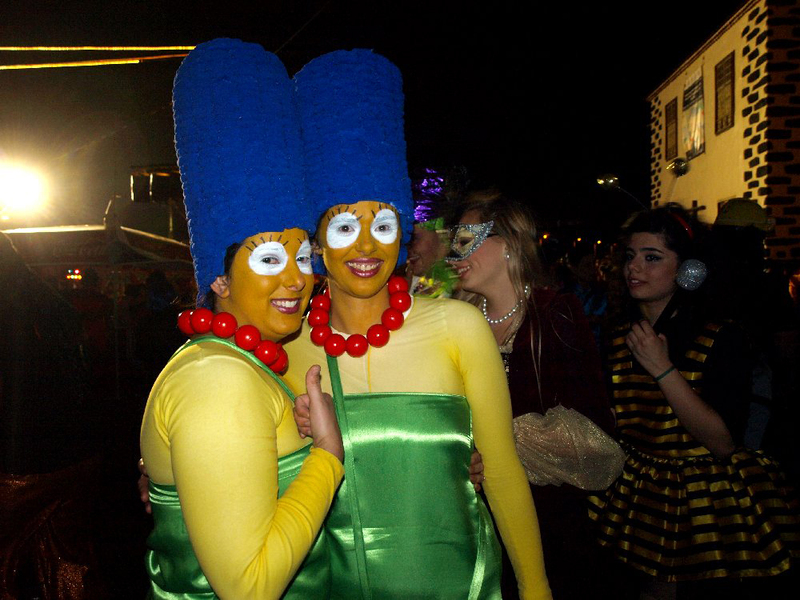 The size of the heels is rivalled only by the height of the headgear, most of which has clearly been modelled on Marge Simpson. There are more false eyelashes than at a Miss World Pageant and the make-up is louder than the steady Salsa beat that pounds out from banks of speakers at either side of the stage while Lupita and her ‘guapas’, ‘cariñas’ and occasionally ‘muchachos’ dance and whoop their way through the never-ending list of contestants. The further down her list Lupita gets, the more unsteady the contestants become on their well-oiled heels and the steps up to the stage are proving to be the first real obstacle in an entire race of obstacles. There are several heart-stopping moments, particularly on the dismount, and several ankles have dress-rehearsal sprains. By the time Lupita introduces contestant number 78, it’s already 10pm and the contestants are only just beginning to make their way to the starting point. It’s going to be a long night. 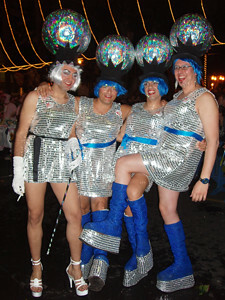 Very few of the contestants will attempt anything more than a fast totter on Puerto’s cobbled streets; in this drag race, there’s very little speed involved, just a great deal of pantomime and thousands of memory sticks filled to capacity with unforgettable images.